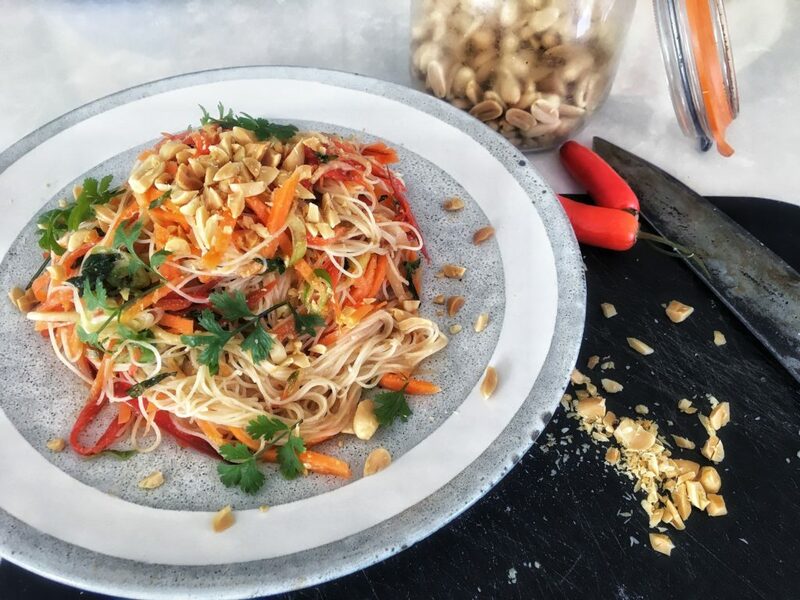 ﻿ Rice Noodle Veg Salad with Sesame Dressing - I AM Co. This has got to be one our favourite summertime salads, just perfect to satisfy post-beach hunger. Loaded with fresh veggies and a supper delicious sesame dressing. Julienne the carrot, cucumber and capsicum using a mandolin. Don’t include the core of the cucumber – this is too watery. Slice the spring onion thinly. Place all the prepared vegetables into a large bowl and set aside. Toast the sesame seeds in a dry frying pan on a medium-high heat. Stir occasionally. These can burn easily so don’t turn your back for long. Using a blender or similar, blitz the sesame seeds until powder-like. Add the rest of the dressing ingredients and blend again until well combined. Assemble the salad by adding the noodles, mint and vegetables together. Using your hands to help separate pour the dressing over and mix until well combined. Top with the chopped peanuts and some fresh chilli if you like.